The Autumn Sun may be retired to stud after holding on to win the Rosehill Guineas. The Autumn Sun has been forced to work overtime, but the star colt has come out on top again to win a thrilling Rosehill Guineas. The Chris Waller-trained three-year-old claimed his fifth Group One win from nine career starts when the $1.40 favourite rallied in testing heavy track conditions to deny New Zealand visitor Arrogant by a head in his first attempt over 2000m on Saturday. Chapada ($26) came in another 2-1/4-lengths away third. The Autumn Sun’s only defeat has been a luckless third in the Stan Fox Stakes first-up last campaign on a heavy track. “He knows how to win but I don’t think he enjoyed it,” part-owner John Messara said. Messara is the proprietor of Arrowfield Stud where The Autumn Sun will stand, but just when that is has not been decided. It could be this year or next with a trip to Europe also an option. “Race day decisions are not good decisions,” Messara said. “I’m going to cool down, have another couple of looks at that race. But I know he didn’t enjoy it. “He made a long, sustained run.It’s good to have that behind us and pity it wasn’t a good track because it would have told a lot more about the horse. “But on a wet track and his first time over 2000 metres, it was a big ask but he came through. “He was labouring at the end but he got there. 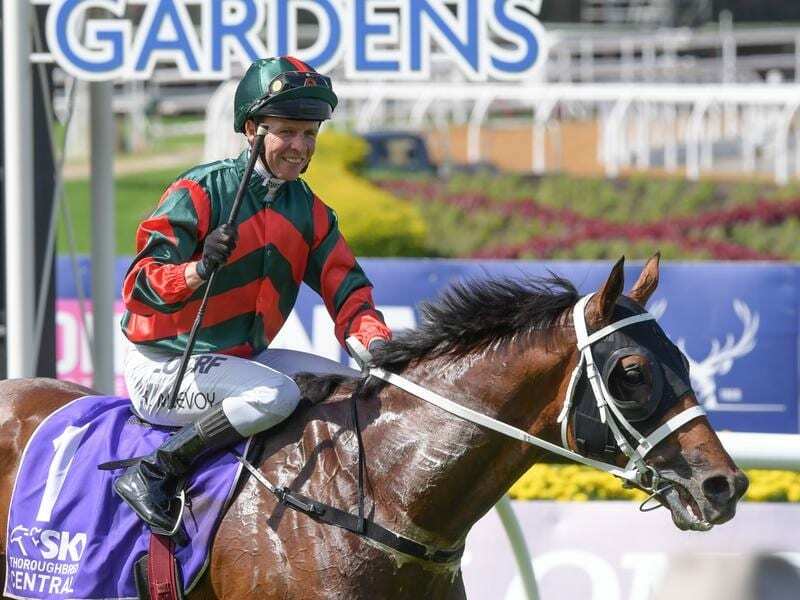 Trainer Chris Waller is convinced The Autumn Sun is still maturing and would be a force should he race on again next season, but is also aware of the colt’s value at stud. “Mr Messara is a good sportsman and that’s why the horse was here racing,” Waller said. “There was concern earlier in the week whether he should be running on a heavy track because he’s still young and not a horse that’s fully matured. “That was a good test the last 200 metres. While he believes The Autumn Sun will be an even better racehorse next year, he said a decision on whether the colt is retired this season would be up to the owners. “I get the importance of the horse’s value,” Waller said. “I get the people at home and the people coming to the races and the media how they want these great horses racing.